As mentioned yesterday, I finally got Tableau Desktop Professional (my favourite Analytics software) running on Amazon Workspaces – deployed for all of $35 for the month instead of having to buy my own Windows PC. With that, a final set of trends to establish what I do right when I consistently lose 2lbs/week, based on an analysis of my intake (Cals, Protein, Carbs and Fat) and Exercise since June 2002. I marked out a custom field that reflected the date ranges on my historical weight graph where I appeared to consistently lose, gain or flatline. 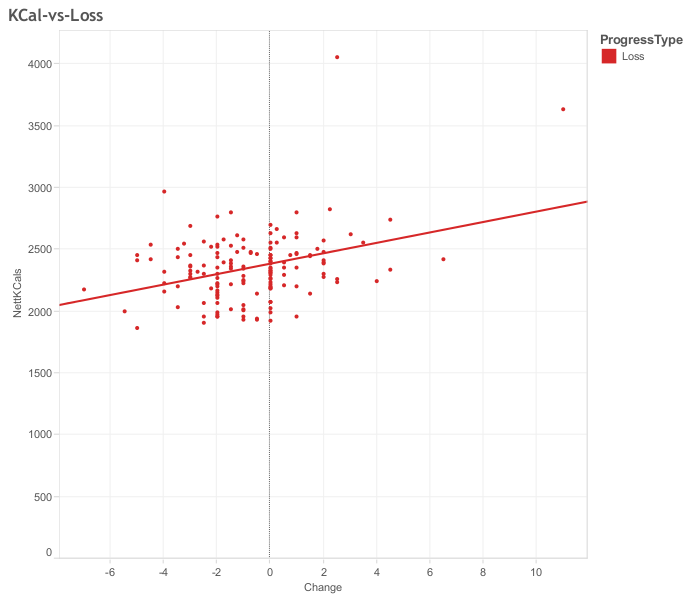 I then threw all sorts of scatter plots (like the one above, plotting my intake in long periods where I had consistent weight losses) to ascertain what factors drove the weight changes i’ve seen in the past. This to nominally to settle on a strategy going forward to drop to my target weight as fast as I could in a sustainable fashion. Historically, this has been 2lbs/week. My protein intake had zero effect. Carbs and Fat did, albeit they tracked the effect of my overall Calorie intake (whether in weight or in the number of Calories present in each – 1g of Carbs = 3.75 Kcals, and 1g of Fat = 9 Kcals; 1g of Protein is circa 4 Kcals). The WeightLossResources recommended split of Kcals from the mix to give an optimum balance in their view (they give a daily pie-chart of Kcals from each) is 50% Carbs, 30% Fat and 20% Protein. So, what are the take-homes having done all the analysis? Breathtakingly simple. If I keep my food intake, less exercise calories, at circa 2300-2350 calories per day, I will lose a consistent 2lbs. The exact balance between carbs, protein and fat intake doesn’t matter too materially, as long as the total is close, though my best every long term loss had me running things close to the recommended balance. All eyes on that pie chart on the WLR web site as I enter my food then! The stupid thing is that my current BMR (Basal Metabolic Rate is the minimum level of energy your body needs when at rest to function effectively including your respiratory and circulatory organs, neural system, liver, kidneys, and other organs) is 2,364, and before the last 12 week Boditrax competition at my gym, it was circa 2,334 or so. Increased muscle through lifting some weights put this up a little. So, the basic message is to keep what I eat down to the same calorie value, less the calories from any exercise, down to the same level as my BMR, which in turn will track down as weight goes. That sort of guarantees that any exercise I take over and above what I log – which is only long walks with Jane and gym exercise – will come off my fat reserves. Simple. So, all else being equal, put less food in my mouth, and i’ll lose weight. The main benefit of 12 years of logging my intake is I can say authoritatively – for me – the levels at which this is demonstrably true. And that should speed my arrival at my optimum weight.